Metro Palais Royal-Musée du Louvre, Paris ? The station was given its current name in 1989, soon after the opening of the new entrance to the Louvre Museum. It is named after the nearby Palais Royal and the Louvre. 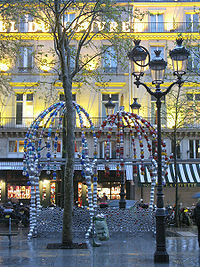 The entrance on Place Colette was redesigned by Jean-Michel Othoniel. In 2000, a century after Hector Guimard, he transformed the Palais Royal-Musée du Louvre into the Kiosque des Noctambules: two crowns made of glass and aluminum conceal a bench designed for chance encounters in the sleepy city.